Spent some time on this AR Drone 2.0 main board to see if it was repairable…. After checking over the main pcb, I have had the small ic U1700 (DMG4413LSS Mosfet) by the power in leads fail on more than 1 occasion and so seeing as I had a spare I desoldered the old one and fitted a new one. The old chip did not read any short and therefore I had a feeling it was okay and connected back the battery and it did the same. So moving on to ic U1701 ( RT8293BHGSP Step down convertor) it also did not read a short, but I noticed it was not producng any 3.3 volts in output pin 3. 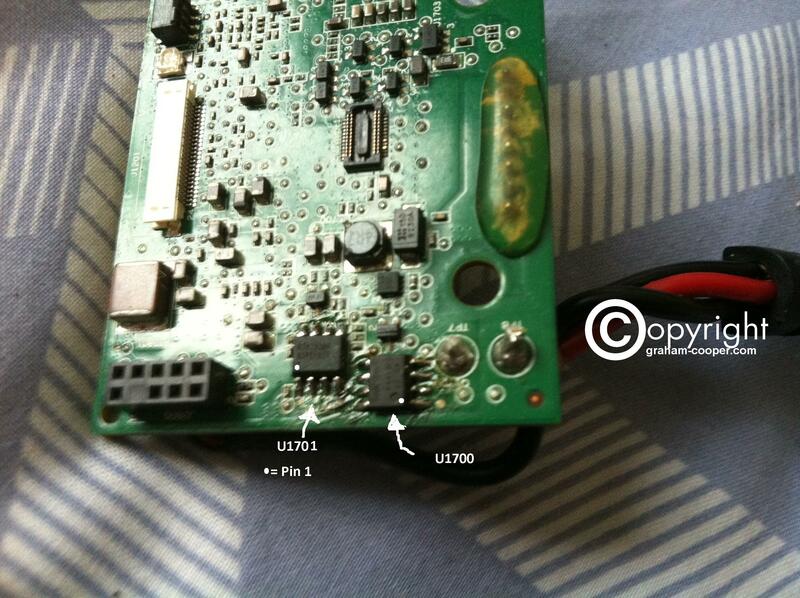 I removed the coil L1702 that is feed from it on other side of pcb , in case something was dragging it down. Did not find any reason why the voltage was not there unless an internal failure of the chip, as it seemed to be getting correct voltages to activate the chip. So as I had a spare chip, I removed it and soldered in a replacement. Connecting back up the battery but with coil still removed it flash up 3+ volts on meter although board still dead as the coil was not back yet. So next test was to solder back the L1702 coil and low and behold the main board led flashed up red and then green. Now why did this chip fail? My thought was maybe as the motor bearings were rusted to hell this blow the chip, but really would have expected IC U1700 to fail to be honest as that supllies all the 12 volt rails and then U1701 converts that to the 3+ volts the Micro and other chips need. But there is also the fact that around the top side of the main board around the L1702 coil it was totally rusted and was all around the coil. So maybe that had been shorting the 3 volt line intermitelly and that caused the failure? Anyway this repair was far cheaper than another Parrot £100 main board…..
Not as pretty repair as I like, but my fine tip solder tip broke so had to use one too big for job really. Also Please Note! on other boards I have changed U1701 , sometimes the earth/heatsink part under chip is soldered to main board and that takes a lot of skill and patient to remove it without disturbing any of the chip components nearby. These boards are very delicate to work on. This time however the earth/heatsink it was not soldered down and came off very easy with a Weller hot air gun on it. Next task to repair the rusted out inrunner motor bearings…………..